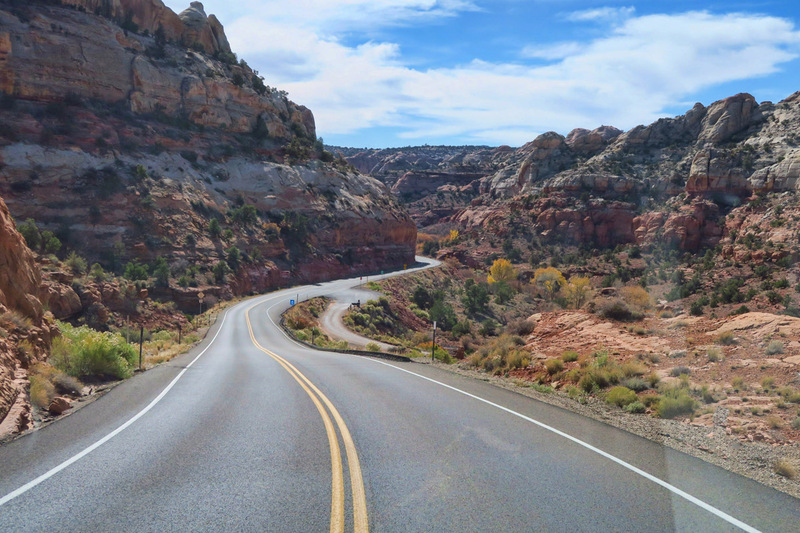 This 124 mile stretch of highway begins near Torrey just outside of Capitol Reef, and continues all the way down to Red Canyon, connecting two national parks, three state parks, one national recreation area, a national monument, and a national forest. 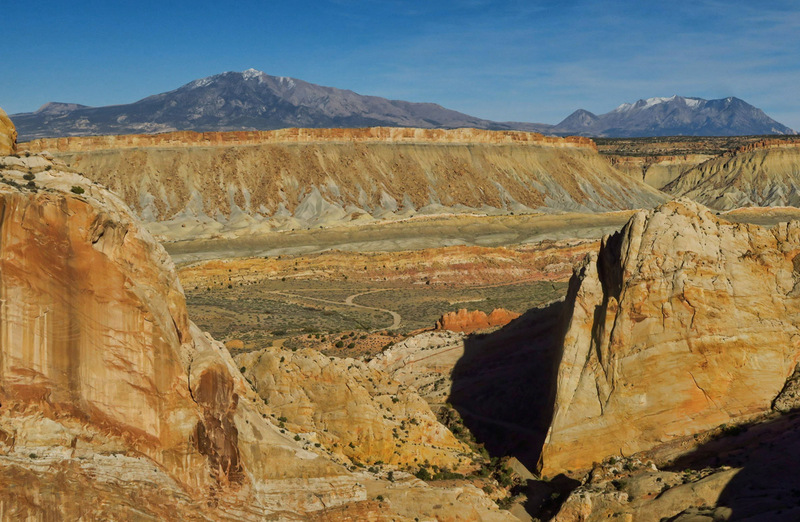 Its elevation change of over 4,000 ft takes the traveler through diverse scenery from evergreen and aspen forests to desert sage to red rock canyons and petrified sandstone sand dunes…if, that is, one has the nerve to look down! Early morning reflections on the windshield make it difficult to capture the steep drop-offs on either side. 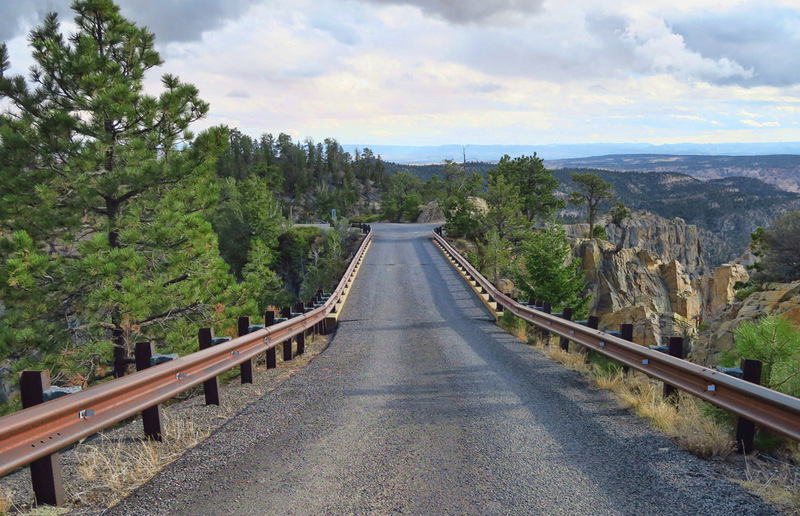 Yes, there are lots of pull-outs, but when the entire road is this scenic, it’s difficult to get up any speed! But this year I was determined, so I began collecting intel. 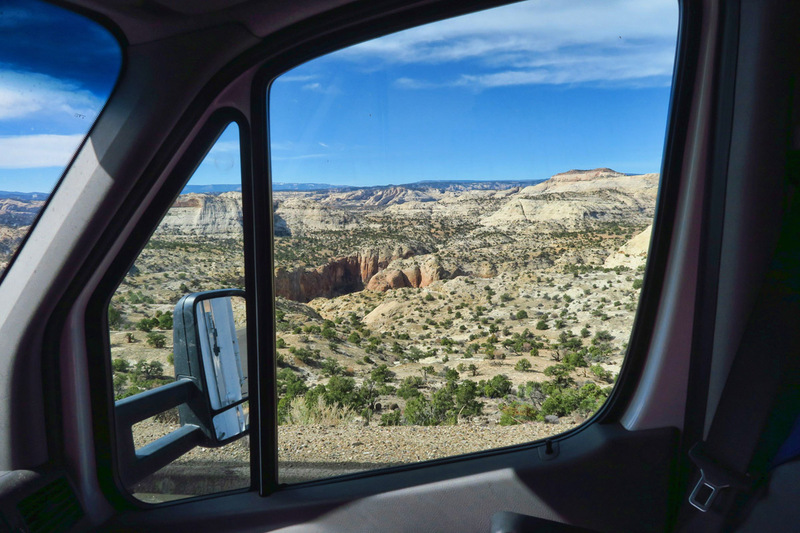 The woman at the Torrey Visitor Center said “Big rigs and cattle trucks drive it every day.” The young man at the Capitol Reef Visitor Center said “There are so many pull offs, you won’t even get up to speed.” So I decide to get an early start and go for it. As long as there are pull offs, I always know I can turn around and go around the long way if it becomes too stressful. 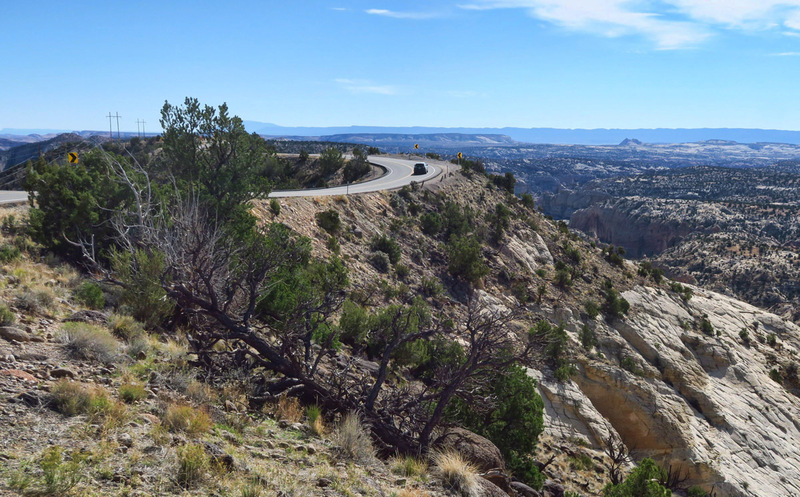 This stretch of Hwy 12 follows beautiful canyons below. Lots of twists and turns, but thankfully hardly any traffic. 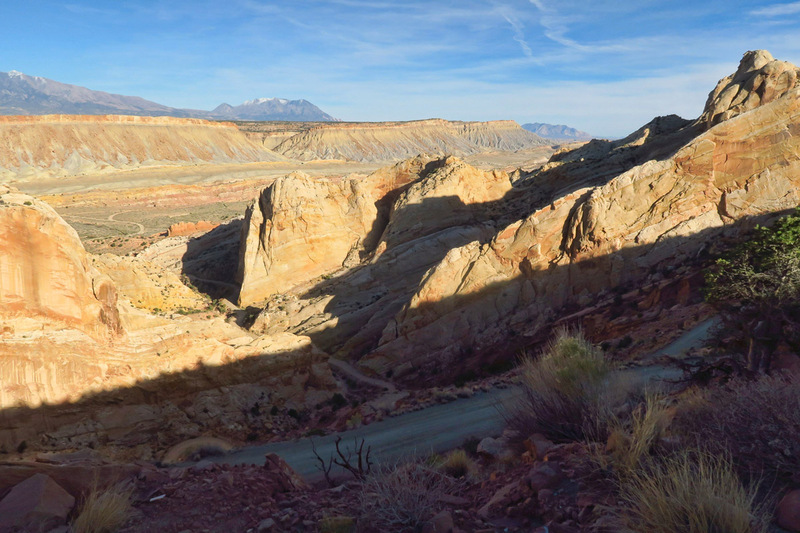 Turn off to Lower Calf Creek. One of the many reasons I prefer using a point and shoot camera over a cellphone camera is the ability to shoot one-handed. I can turn on the camera, point and shoot, and return it to the shelf on my dashboard, all while keeping my eyes on the road and one hand on the wheel. 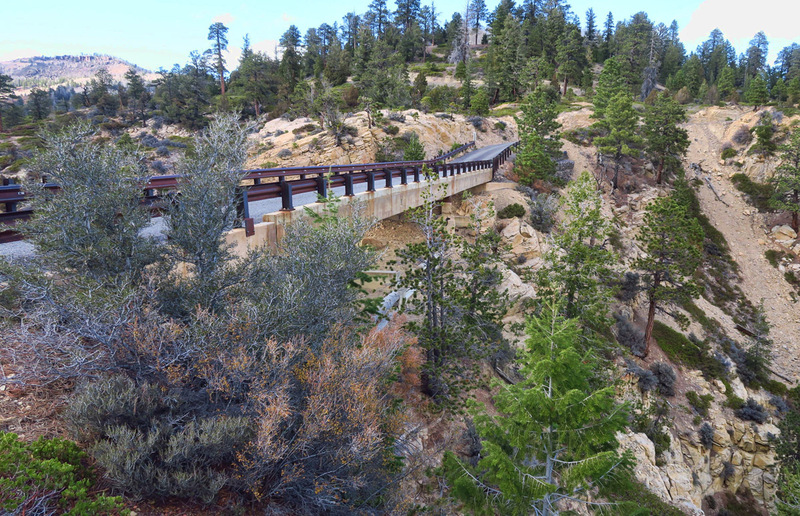 This section known as the “cream Cellar Route.” Between 1924 and 1940, as many as 50 five-gallon pails of cream were shipped 3X per week by postal service mule train bound for Bryce Canyon Creamery. Look closely to see the narrow ribbon of road across and up thru center of photo. 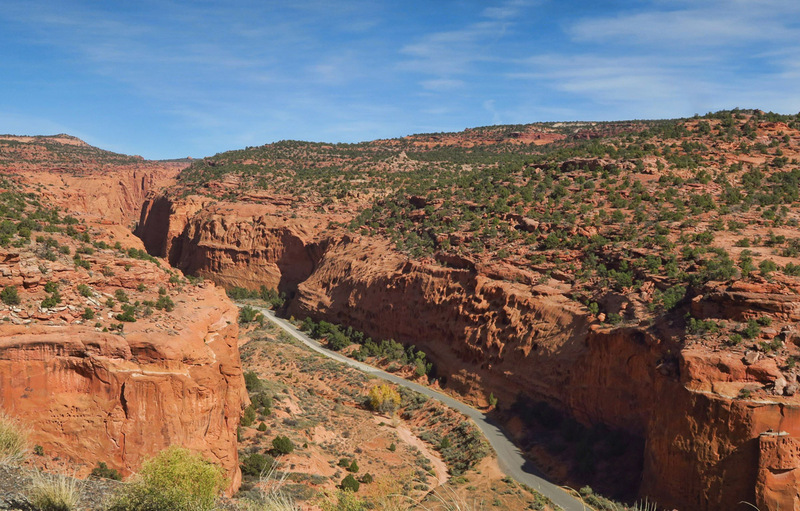 It took five years and tons of dynamite for the CCC to complete in 1940, cutting through sandstone ledges down to the Escalante River and up Calf Creek Canyon. Boy, was I ever wrong about Boulder! A stop at the BLM office there (one needs a free permit to boondock in this area) reveals a cool little enclave in the middle of nowhere. 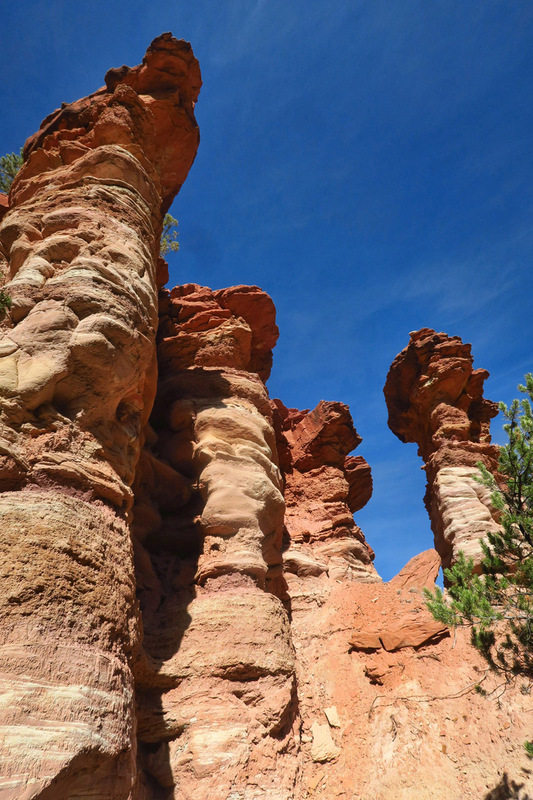 I first realize I am in “friendly territory” when I see signs plastered all over town, “Save the Grand Staircase-Escalante” that would have made Edward Abbey’s Monkey wrench Gang swell with pride. Next, I see the local food truck with outdoor fire and live music. Finally, when I ask the woman at the BLM office if there is a good place for lunch (the food truck had just closed) I learn this small town of 225 is home to a James Beard Award semi-finalist masquerading behind the ominous name, “Hell’s Backbone Grill.” Had I ever wrongly judged this book by its boring cover. Boulder is a happenin’ place! Hell’s Backbone Grill in Boulder, UT. Don’t miss it! This was the best dinner I’d enjoyed in weeks, particularly after eating my own cooking while in the national park CG. 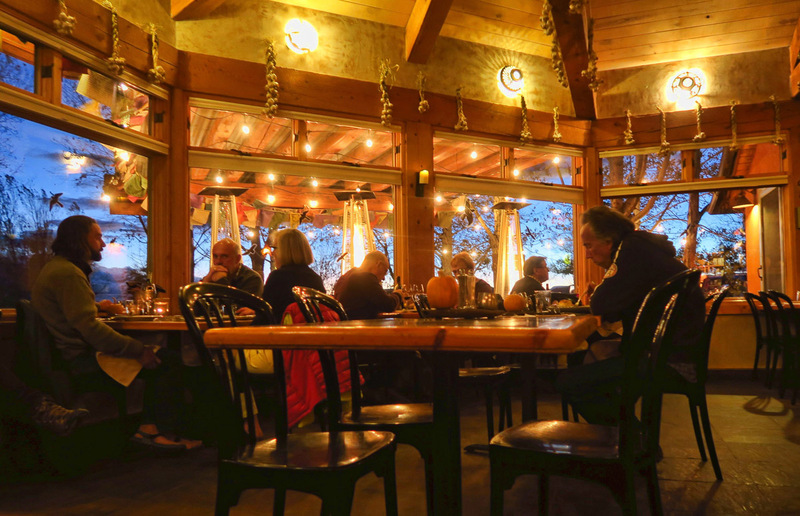 The restaurant has a warm ambiance, especially decorated for fall. Beautiful sunset views outside the restaurant. Boulder was another one of those places where I came with the intention of maybe staying one night if I could find a place to park. I ended up staying three, and would have stayed longer were I not trying to make a deadline. But I left with a mental “bookmark” to return one day. Maybe next time with a little less tonnage, a tent, and a wilderness permit. 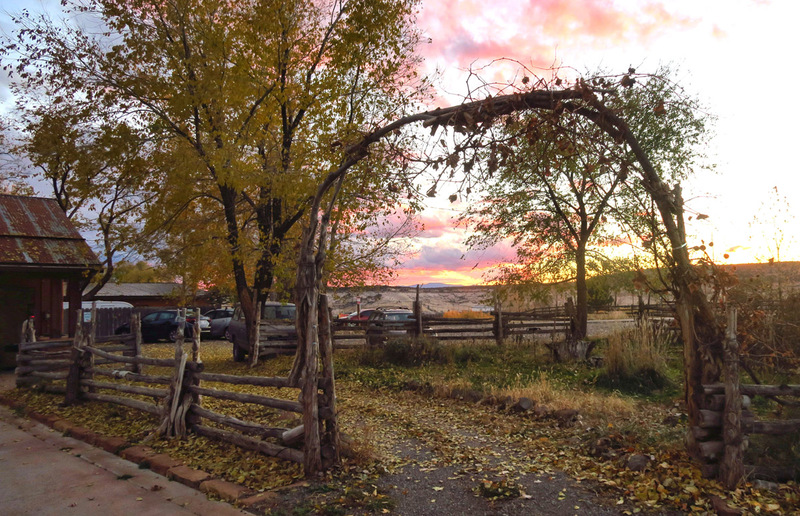 The Burr Trail, named for John Burr, a cattleman who developed the livestock trail to move cattle back and forth between winter and summer ranges and to market, starts as a spur off Hwy 12 in Boulder and travels all the way to Bullfrog Marina on Lake Powell. 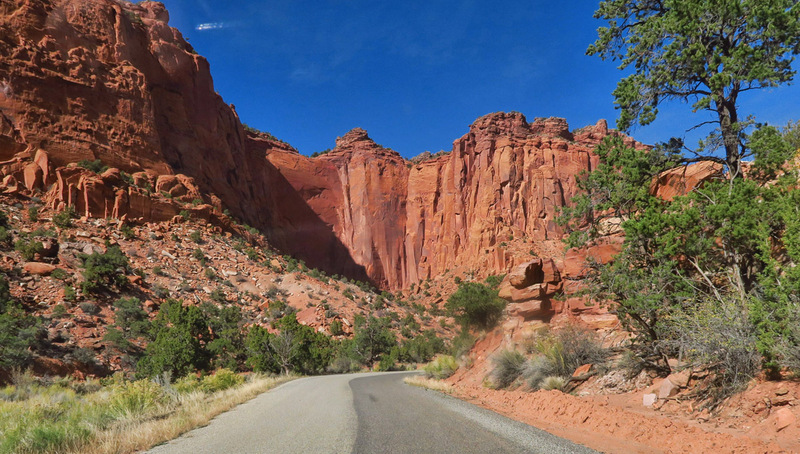 This part paved, part gravel road passes through magnificent Long Canyon, enters the back door of Capitol Reef National Park, across Grand Staircase-Escalante National Monument, and down through Glen Canyon National Recreation Area. 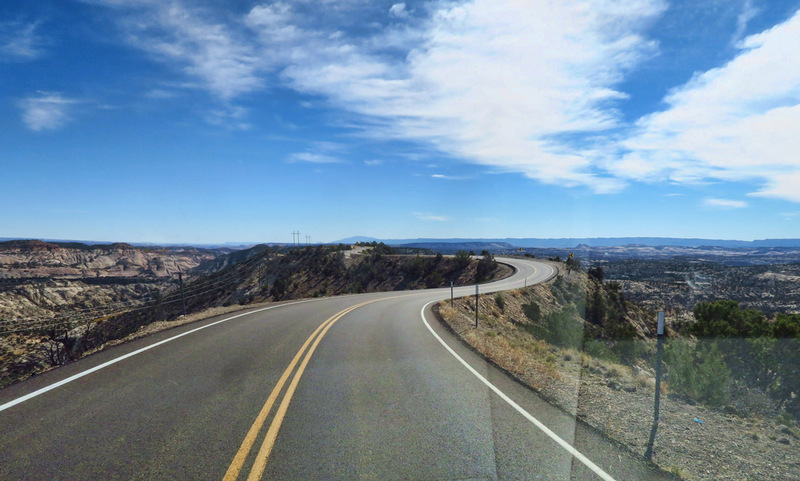 The most famous section of this road is the Burr Switchbacks, where the road descends 800 ft in less than a mile by way of half a dozen hairpin curves. 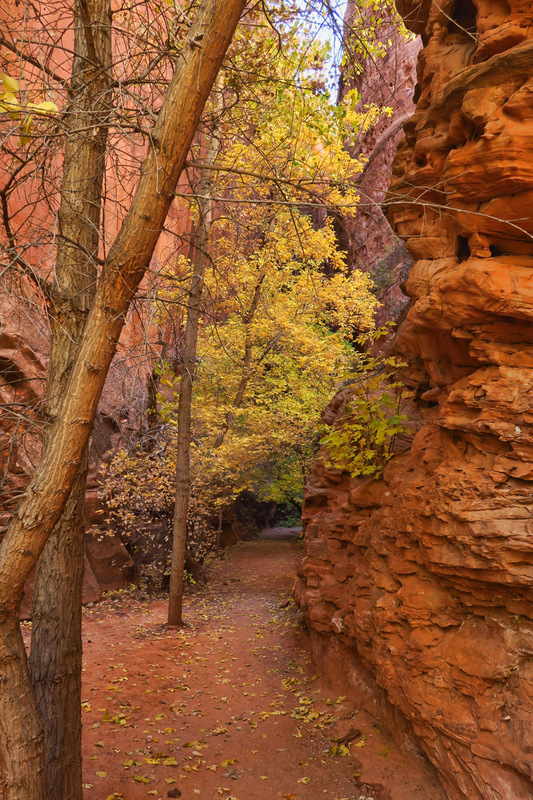 The Burr Trail out of Boulder passed through stunning Long Canyon. 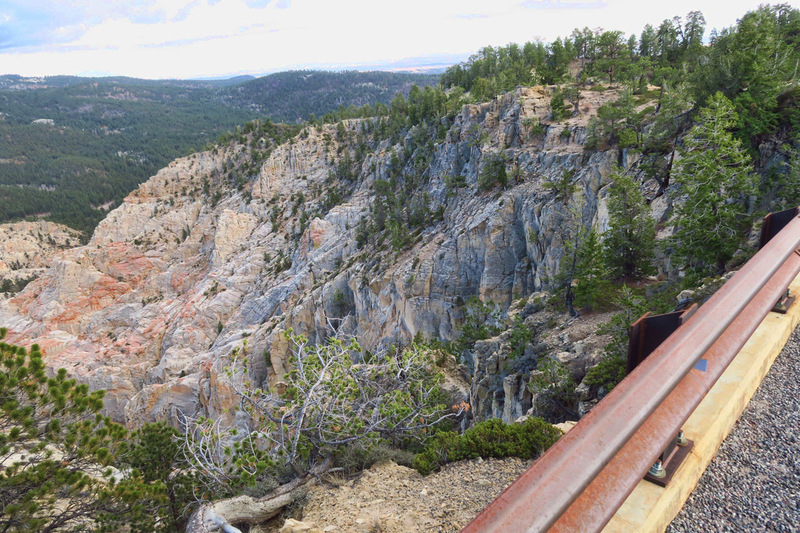 Long Canyon is seven miles of the 30+ mile drive. At around 11.5 miles in, there is a “slot” on the left. 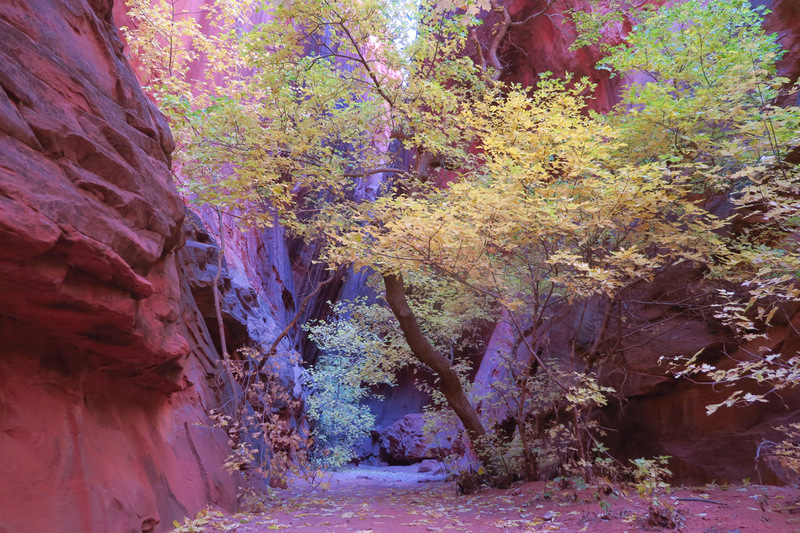 Not long enough to be a slot canyon, but beautiful nonetheless. Filtered light in the alcove is lovely. 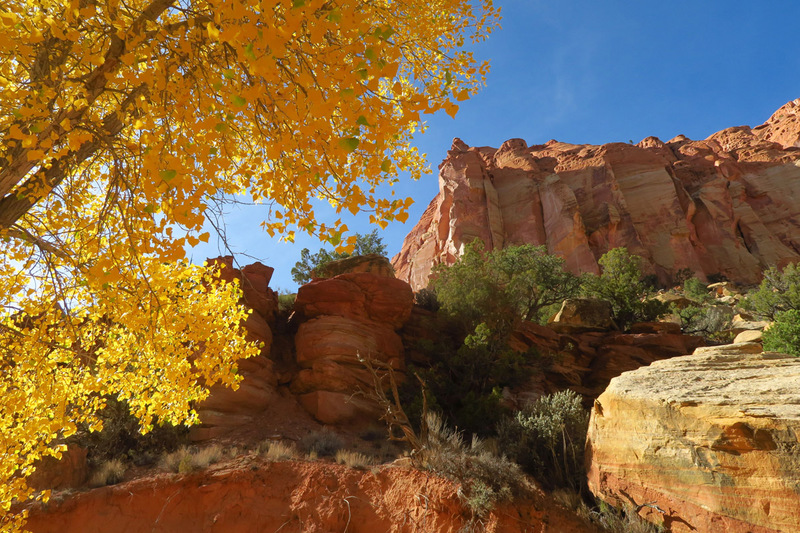 The wash is filled with golden cottonwoods. 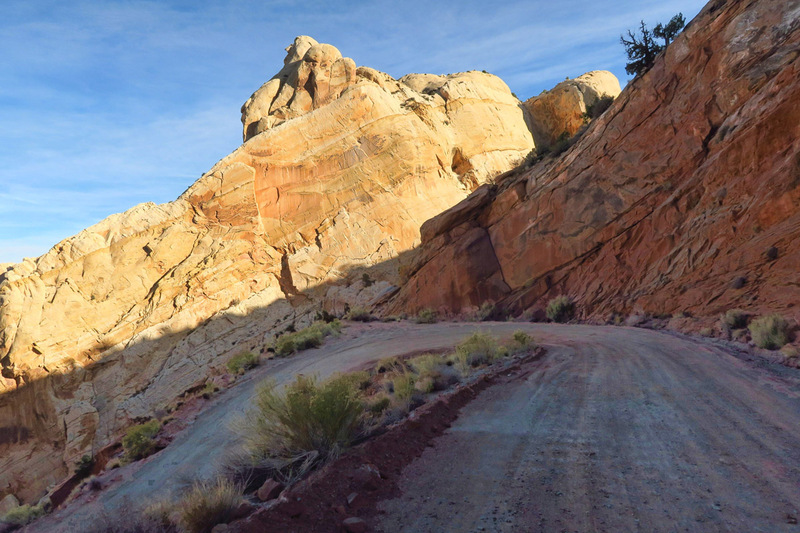 The paved road turns to gravel at the boundary of Capitol Reef National Park. 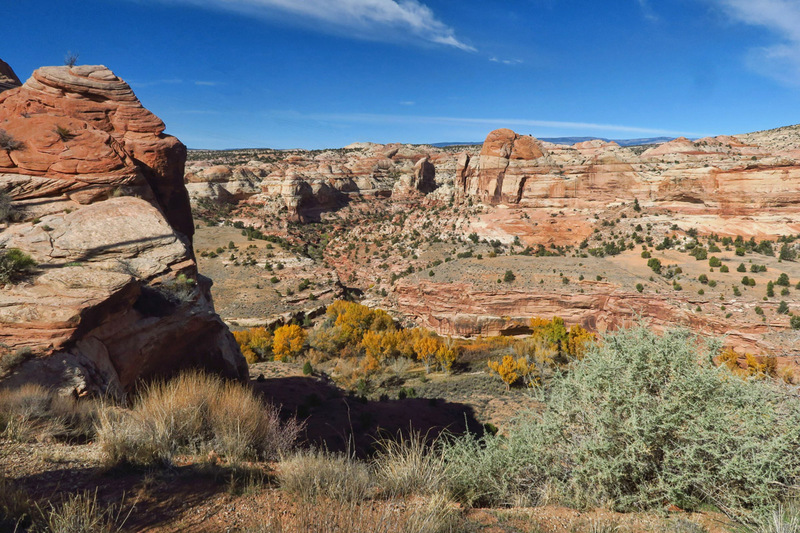 These rounded mounds of eroded wingate sandstone were named the “Circle Cliffs” by John Wesley Powell. Great views of the undulating reef of the Waterpocket Fold from here. The Tracker contemplates the 12% grade of the Burr Switchbacks ahead. A lovely picnic area at the top of the Burr Switchbacks. The rock formations on both sides of the switchbacks look like aftermath of an earthquake. Too bad the ribbon road below is in the shade. 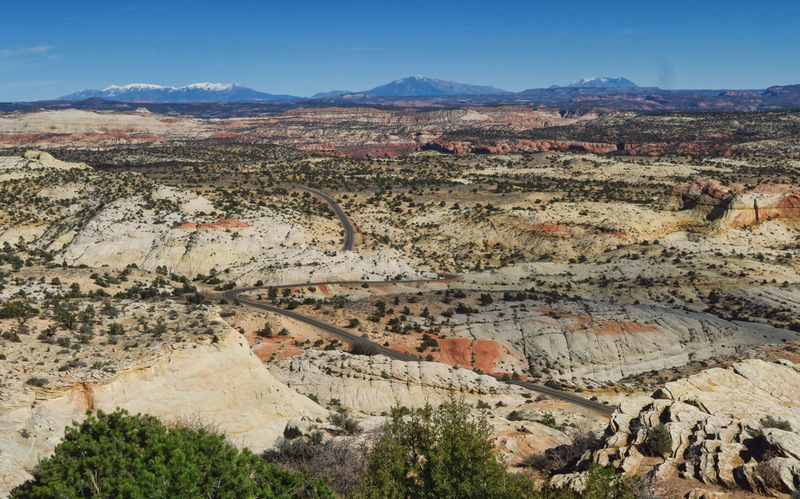 See road to far left of photo…intersects with Capitol Reef’s Notom Rd, making a loop back to the national park possible. Mountains in distance are Henry Mountains, named by John Wesley Powell for Professor Joseph Henry, then Secretary of the Smithsonian Institute. 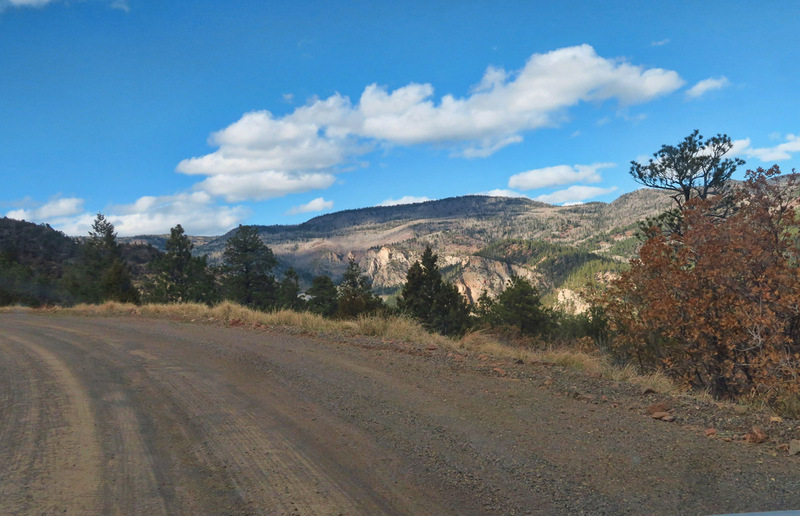 Continue on down Hwy 12 just about three miles outside of Boulder, and you come to another turn off to the right known as “Hell’s Backbone Road.” Built in 1933 by the Civilian Conservation Corps (CCC), this gravel road was the first automobile access between Boulder and Escalante. But it wasn’t passable during winter months, so residents had to return to using pack mules along wagon trails through the canyons in winter. 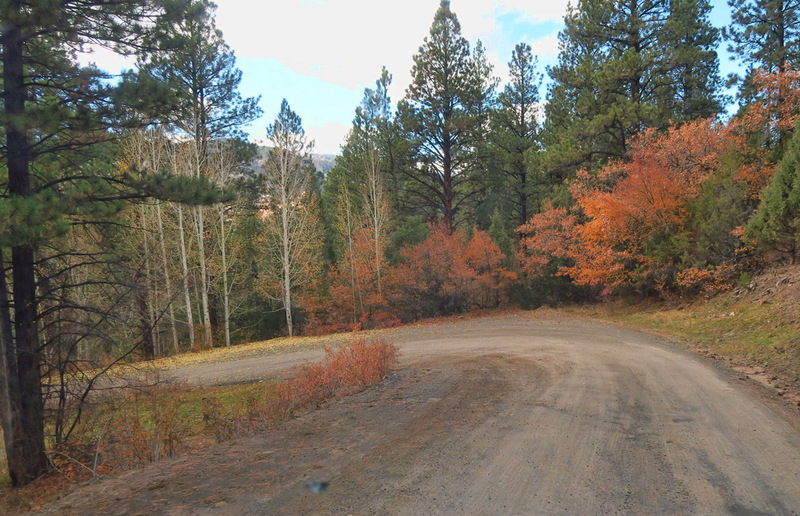 In 1940, the CCC completed Hwy 12, making all-season passage possible. 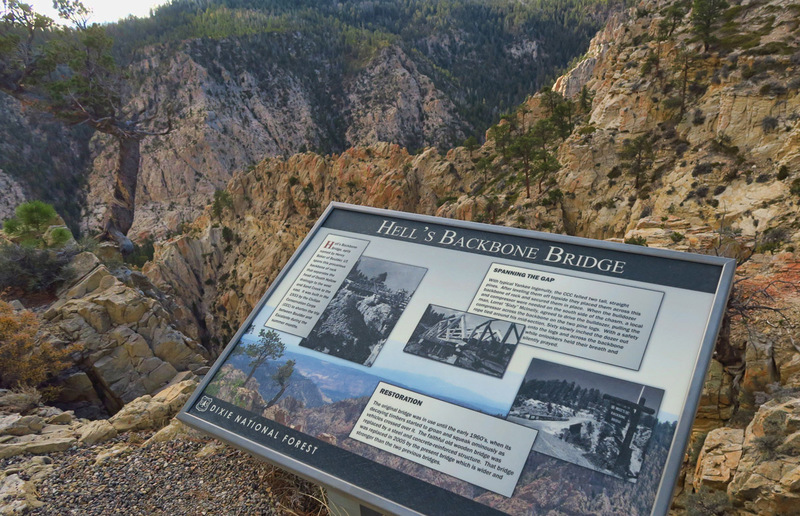 Hell’s Backbone travels through thick pine and juniper forest to an elevation of over 9,000 ft. 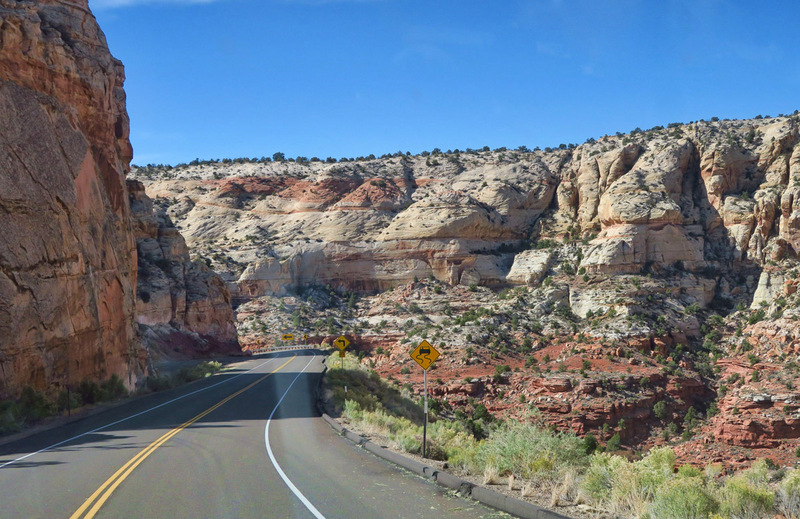 While it’s a lovely drive along the twists and turns through the woods, the scenery on Hwy 12 between Boulder and Escalante is vastly more beautiful. So why drive Hell’s Backbone Road, one might ask? Because I want to see the Hell’s Backbone Bridge. 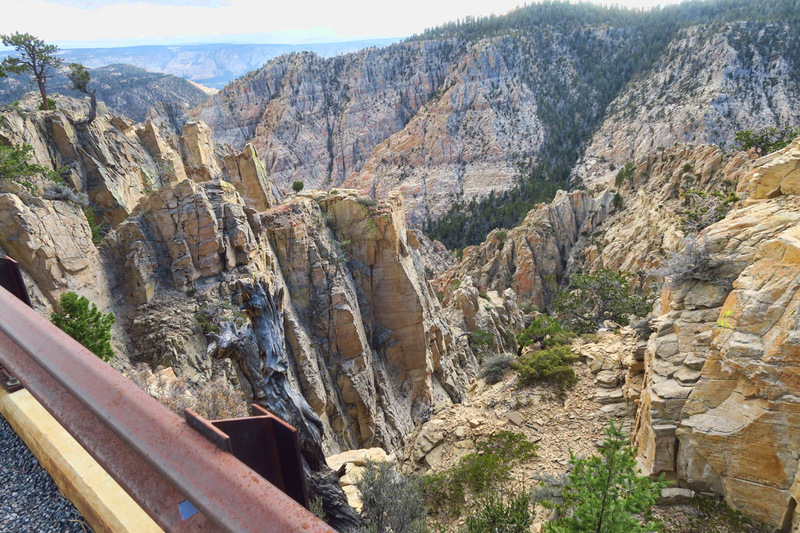 Just 14 miles from my boondocking location, about halfway between Boulder and Escalante is the scary concrete span across the Box-Death Hollow Wilderness. Who could resist such a place? 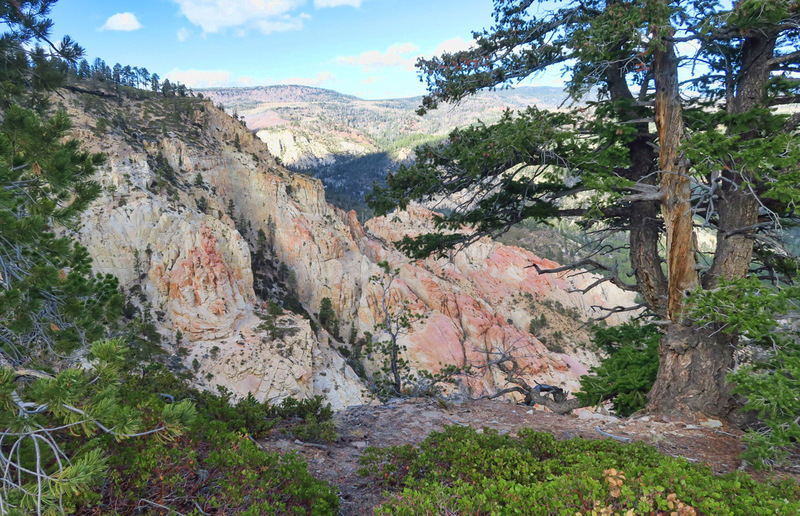 In order to span this 1,500 deep chasm between Box-Death Hollow Wilderness and Sand Creek, the CCC felled two tall, straight pines. After leveling them off topside, they placed them across the span. When equipment was needed on the opposite side of the chasm, a bulldozer was driven pulling a compressor across the backbone on two pine logs with nothing more than a rope tied around the driver’s waist. While Hell’s Backbone Road is certainly scenic, it’s mostly in the trees. There are a few puckering, no-guardrail views…. …such as this glimpse of Sand Creek. 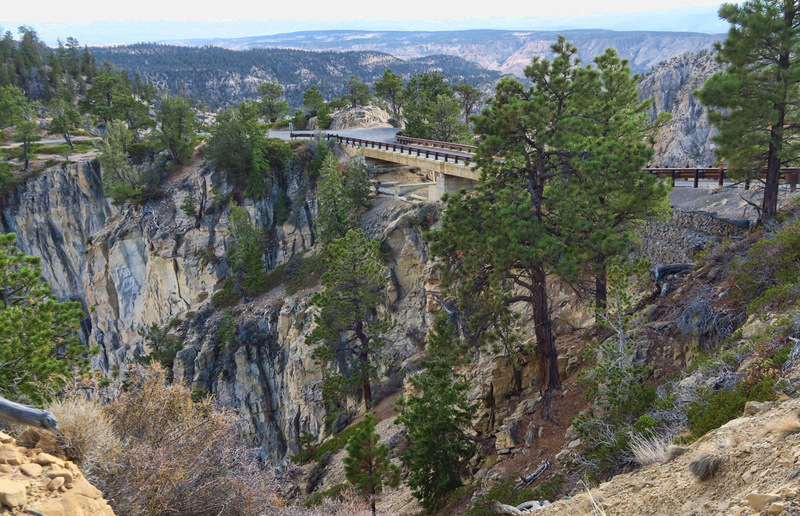 This 109 ft concrete bridge spans a chasm with 1,500 ft drop-off on either side. Perspective is impossible from this angle, but I will tell you my knees were shaking. If you look just beneath the concrete span, you can still see some of the wooden rails from the original CCC-built bridge. A look to the east over Sand Creek. A look to the west over Box-Death Hollow. 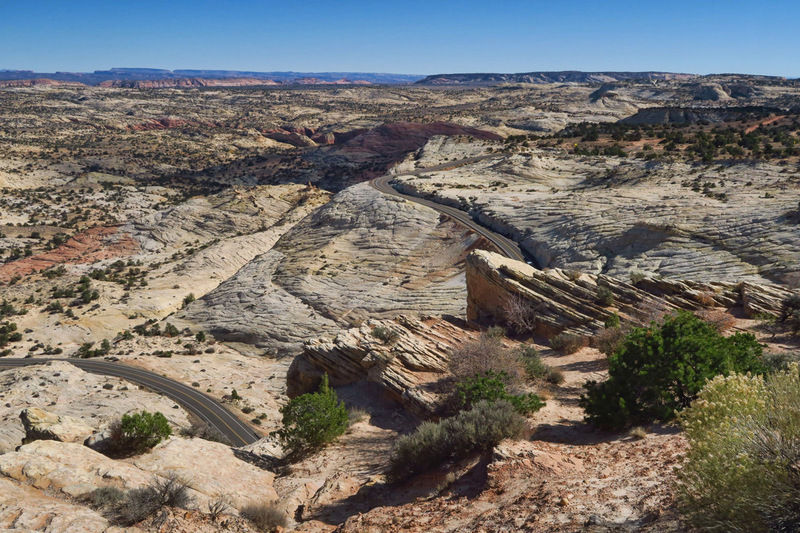 I think bears repeating that each of these three stunning roads passes through public lands. Whether it be the National Park Service, the National Forest Service, or the Bureau of Land Management, they are all PROTECTED. That’s why it’s possible to gaze out across the buttes, mesas and canyons all the way to the horizon (or even view these photos for that matter) without seeing billboards and condos, ziplines and skywalks, casinos and ghettos. Imagine, if you will what these views would look like without these federal agencies charged with preservation, conservation, and protection. 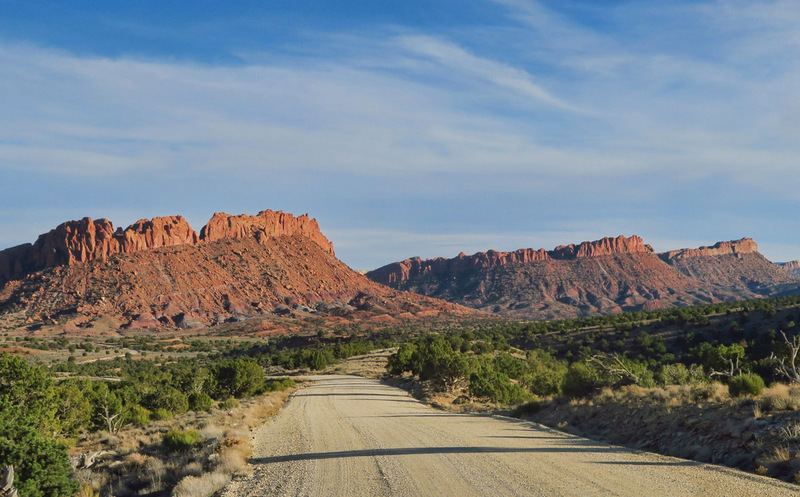 These roads were built at the hand of the Civilian Conservation Corp whose name, but more importantly, whose mission centered around “conservation,” of our natural resources. Federal branches under the Department of the Interior (excepting Zinke) have been working ever since to keep the wilderness areas pristine. 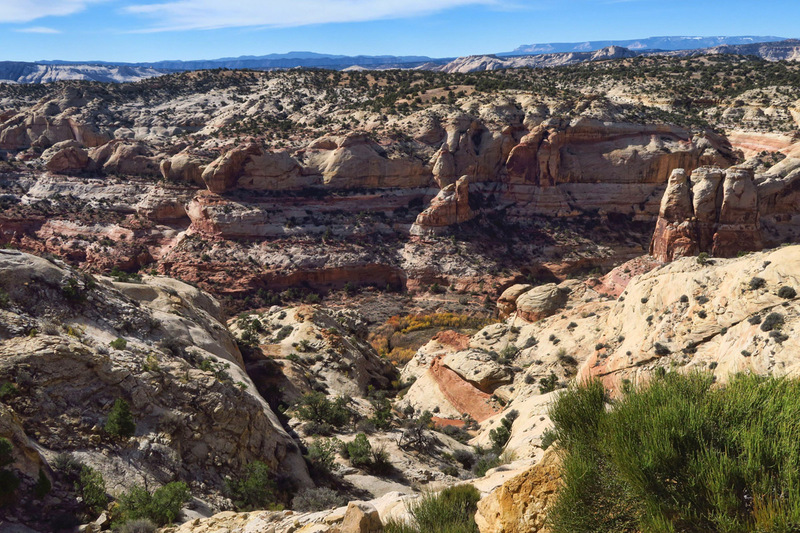 It’s important to do all we can to support the efforts to continue to preserve and protect these public lands such as Grand Staircase-Escalante, which the Trump administration plans to reduce by more than half, allowing all terrain vehicle traffic and mining claims to be staked. Yep….there’s coal under that there plateau! “This Land is Your Land.” Let’s please work together to love, honor, respect and protect it while we still can, so future generations can experience the joy and appreciation of what’s left of our wilderness. 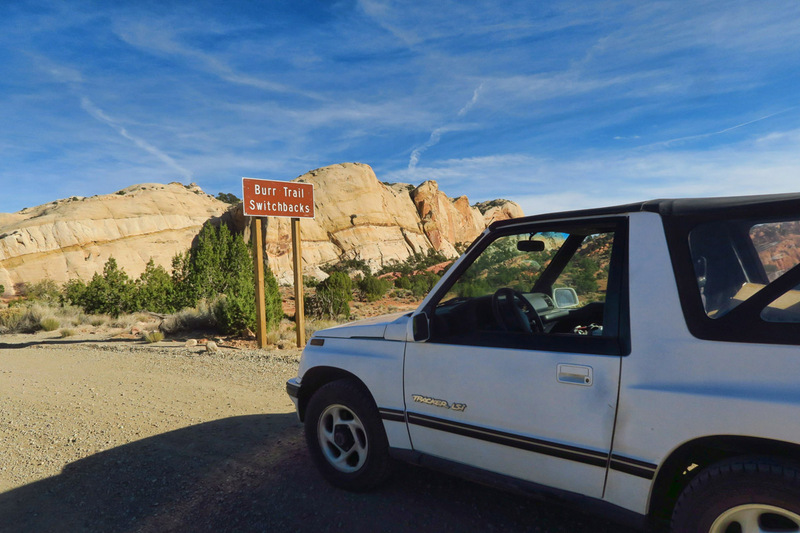 This entry was posted in Utah and tagged Boulder, Burr Switchbacks, Burr Trail, Grand Staircase-Escalante National Monument, Hell's Backbone Bridge, Hell's Backbone Grill, Hell's Backbone Road, Hog's Back, Scenic Highway 24 by Suzanne. Bookmark the permalink. Gosh, your report makes me hungry for Utah and highway 12. Thanks for an awesome blog! Thanks for following along, Gumo! 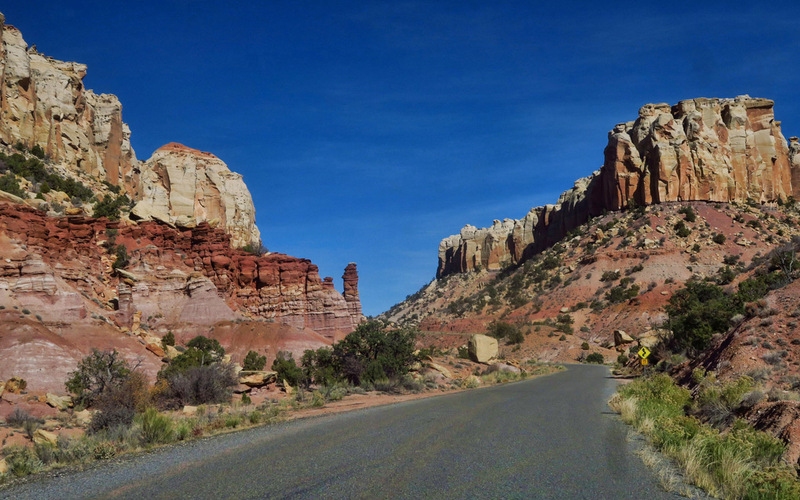 We once car-camped out our Miata in Capitol Reef and then took 12 to Bryce. I should have slowed down. We missed a lot between the two parks. Thanks for your wonderful blog, story telling and pics. Great stuff always. Just breathtaking, thanks for being brave enough to drive those “roads”. Thanks, Kathy, for the nice comment. Gorgeous and you’re so right about protecting it!!! We have to hold our parks gently and pass on to future generations! What a gorgeous area to explore! Will have to file this info away for exploring Utah plans. 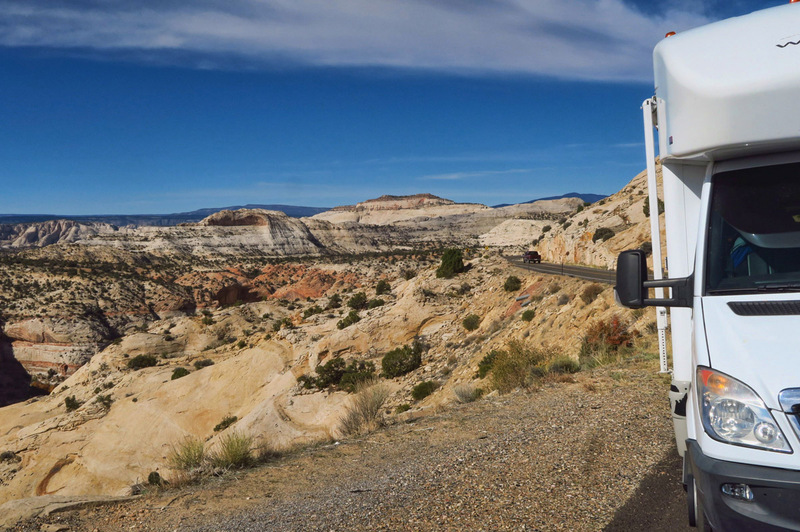 Chris has always wanted to try driving a semi-truck on the scary Million Dollar Highway between Ouray and Silverton. Don’t think I want to experience that with him. So glad you finally drove that road. I have driven our 26 footer towing on it several times and it really isn’t difficult, as you discovered. The Burr Trail is my homeland. 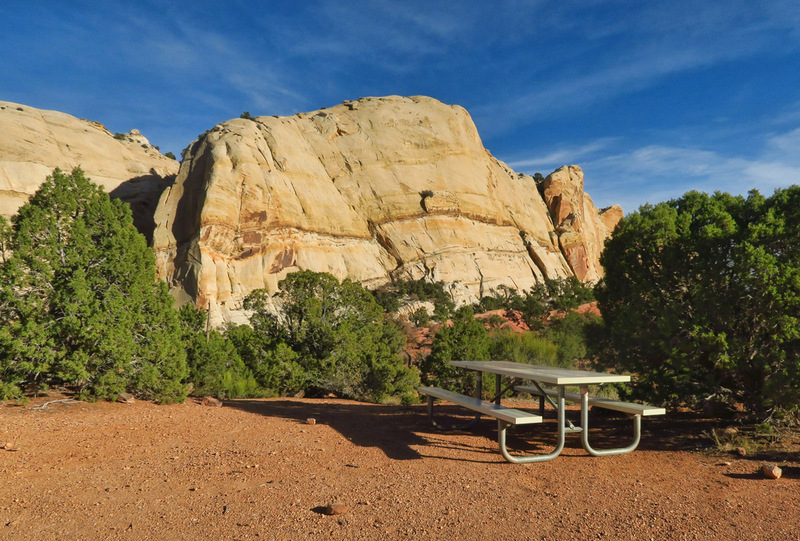 I actually camped at that picnic table you photographed one year in my friends 19 foot Roadtrek, so we were there at sunrise. I know, I know…no camping allowed, but back in the late 90’s no one was around and no one cared. It was a great beginning to hiking Muley Twist. I also boondocked at Studhorse Peaks, and back in behind that area to the north toward the Circle Cliffs for several days and never saw another human. The only sign of civilization my friend and I saw were the red tagged sticks marking where Conoco planned to build roads and drill. Can you say Monkey Wrench? Sara and I took out a couple of miles of those stakes, with great pride. I don’t think they ever actually managed that road and thank goodness they never drilled. That road was in sight of the back side of the Strike Overlook. I’ll be returning in late September this year, my heart yearns for the Burr Trail Switchbacks, and dropping down to the NoTom, and yes, Suzanne, you didn’t make it to the top of Mt Ellen, but maybe someday you will. Heart of the earth, center of what I call the Magic Circle. oh oh oh…your posts lately have made me yearn so. 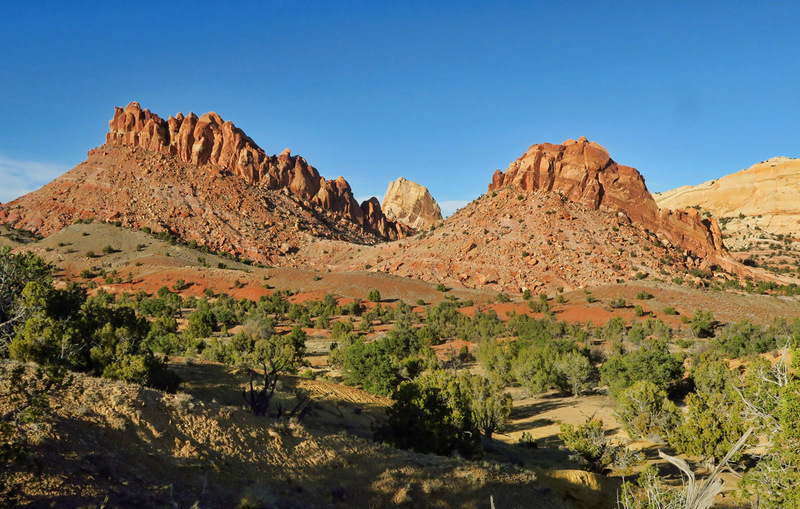 That same friend and I camped in Cathedral Valley in 1996, in view of the amazing spires. I did a vision quest there that year, she remained in camp and I hiked up to a mound at the end of the trail and spent probably the strangest night of my life there. Her ashes are now there. I only learned recently that Native Americans don’t like this, and of course I did know it was illegal in the National Park at the time, but she asked, and I did it anyway for her in 2007. Don’t miss Cathedral Valley. No RV will get back there, you need a sleeping bag and a tent and your tracker. My first thought when I saw that you were driving highway 12 was “Oh I wish I had known you were going to do that so I could tell you about Hell’s Backbone Grill”!!! 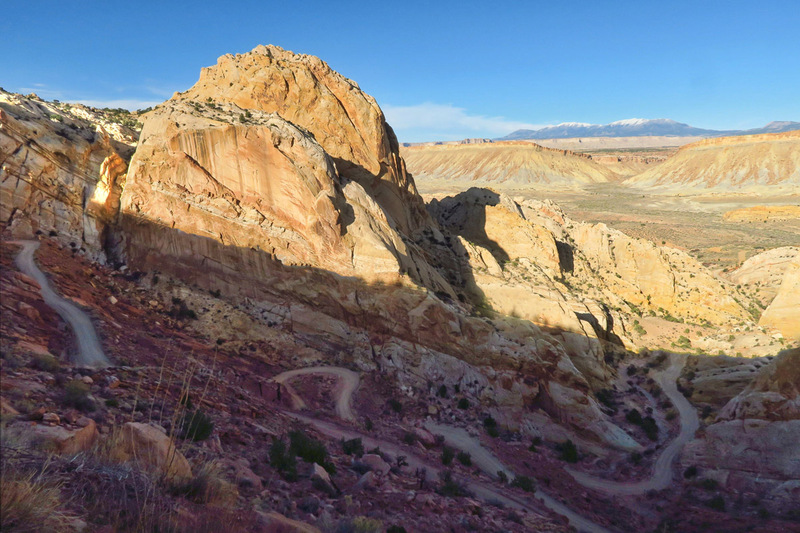 Jen and Blake, the 2 women who own it are probably responsible for all the Save the Grand Staircase-Escalante signs you saw. They went to Boulder from Flagstaff about 15 years ago I guess, were cooks on river trips in a previous life, and are passionate about that area. The book, With a Measure of Grace, along with having recipes from the restaurant, has beautiful photos of the area and the interesting story of the history of the restaurant. I have lots of special memories of meals there…and I think that area is one of my favorite places in the world. Seeing this blog post literally brought tears to my eyes. Thank you…again! Kat, thanks for this wonderful background story. Although I did not get to meet the owners, I did have a very rich conversation with the woman who was my server. 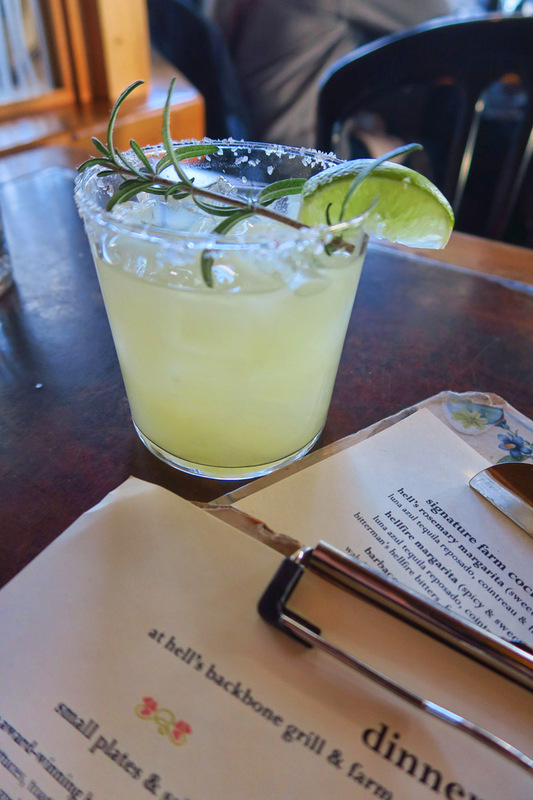 It all started with her “I Voted” button, and ended up being a bit of a history lesson on the restaurant, as well as the town. The love in this restaurant was palpable, and I had the most remarkable table, as I watched the sun set in one direction, light up the sandstone in the other, and watched the golden leaves cascading in between. A magical night indeed. Your fall photos are gorgeous!! Amen sister! We’ve got nothing if we kill off all the natural world. 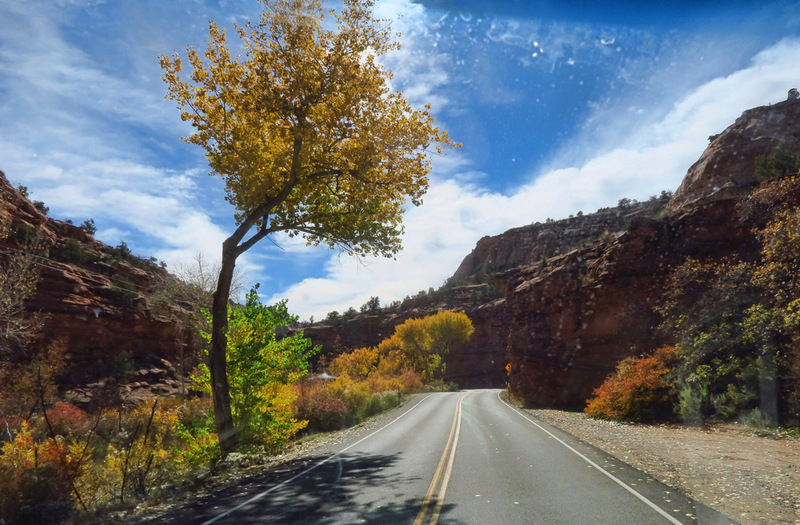 We’ve driven stunning Hwy 12 before but not the other two…they are on my some day list! 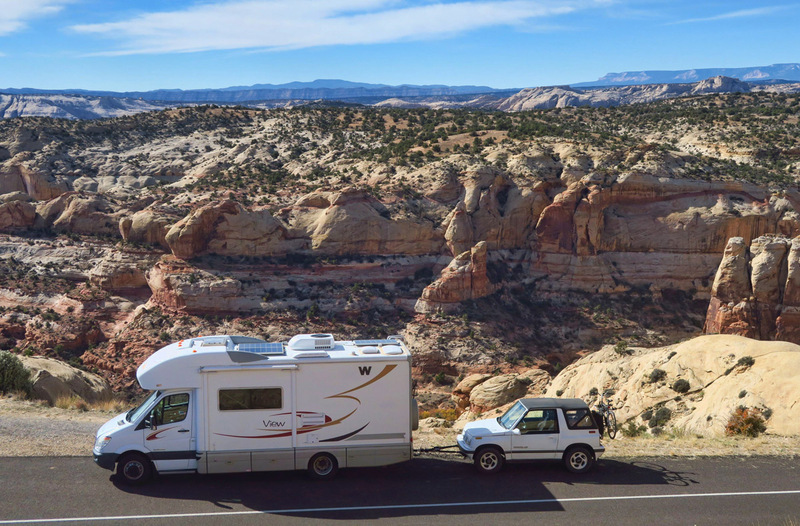 We once spent two weeks in Escalante and loved every second of it. That area is some of the best in the west. We were in all these places this past May and every moment was glorious. Glad you worked up the courage to do the Switchbacks. We did that in our rig and Notom Road is the very worst road we have driven on anywhere, US or Canada. 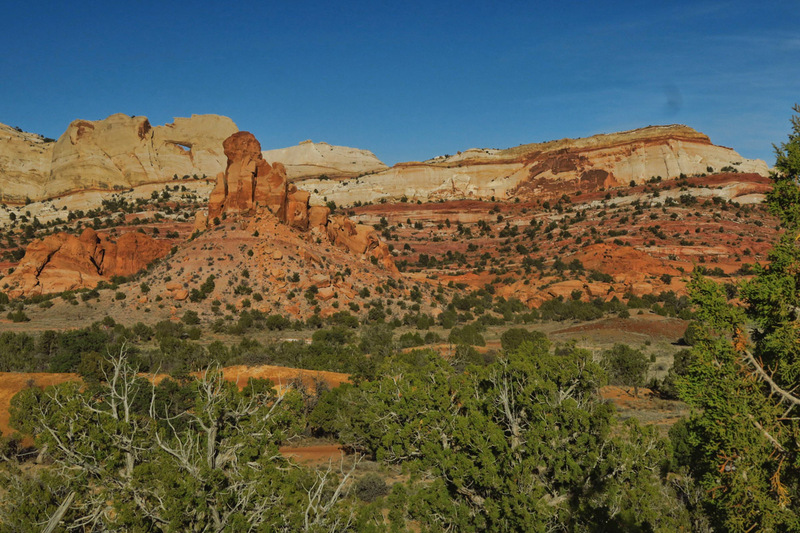 The whole state of Utah is on our must go back list. Ed, it was you and Marti who encouraged me to do the Switchbacks, so thanks for that! Still can’t believe you did them in your rig! Though I did the Moki Dugway in the Winnie. And then there was Meat Cove. haha! The louder the crashing sounds inside my cupboard, the higher my anxiety! Thank you Suzanne for this posting. These are exactly the types of roads that I seek now that my hiking days are in the past. As always I stand in awe of your adventurous nature and bravery. As a young man I was a solo hiker, usually bushwhacking in my native Adirondacks as well as the forests and mountains of the northern New England states. I stand with so much appreciation of your solo hiking that I am surprised when you express concerns about driving on some roads, but am not surprised that you can overcome those fears and provide your followers with another blog full of great prose and photography. Again thanks, as I work my way through my mid seventies I stand in awe and appreciation of this masterpiece. Thanks for the lovely comment, “a.” (Not sure if WordPress cut off your name..sorry.) I have always been a nervous driver, which is pretty ironic for someone who lives on the road, right? haha! I think it’s a “control issue.” I have lost control of a car on more than one occasion…usually on “black ice” that often plagues central Texas. Another time because I fell asleep at the wheel when I was only 18, lost control and almost wiped out my entire family. So I am rarely calm or relaxed behind the wheel on a good day, especially when driving the RV and towing. Put me on something called a “Hog’s Back” or “Hell’s Backbone” with no guardrails, and I have to fight back the fear. But I have always been comfortable on my own two feet, and find pleasure and relaxation in walking long distances, particularly when I can control the speed and direction. Thanks again for the comment. Oh! It was such a lovely comment, I should have known it was you! I should have thought to cross reference the address in my comment stats, but was trying to respect “a”‘s anonymity. haha! Thanks for your continued support, Allen. Glad you got the “guts” to drive the road, absolutely beautiful! The “slot” canyon picture was my favorite. Having driven all of these roads I am so glad you got to experience and enjoy them. We have been twice and if I am able to go again I will be soooo happy. Thanks for sharing…I enjoyed each and every photo and word! I love every single picture in this post. They are forcing me to go back to CapReef. I very much appreciate your ability to summon the courage to “Gut-up”. 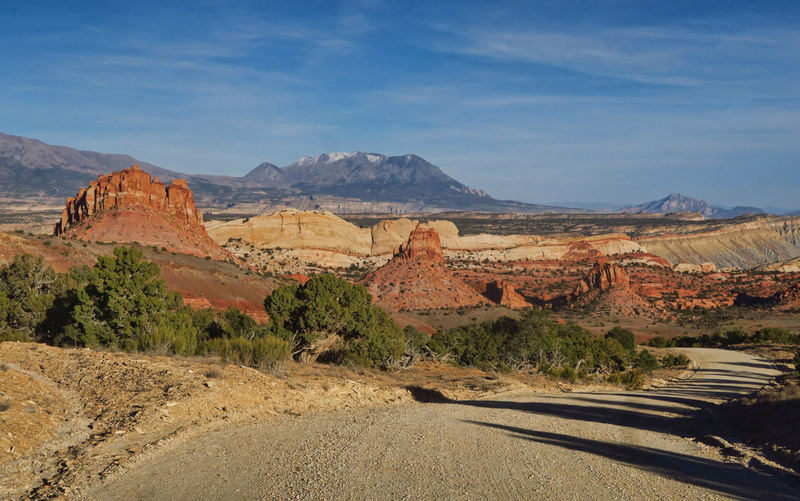 I have driven that UT12, but the Burr Trail, and that Hell’s Backbone were eye-openers. There’s that Civilian Conservation Corps once again, what a force they were. 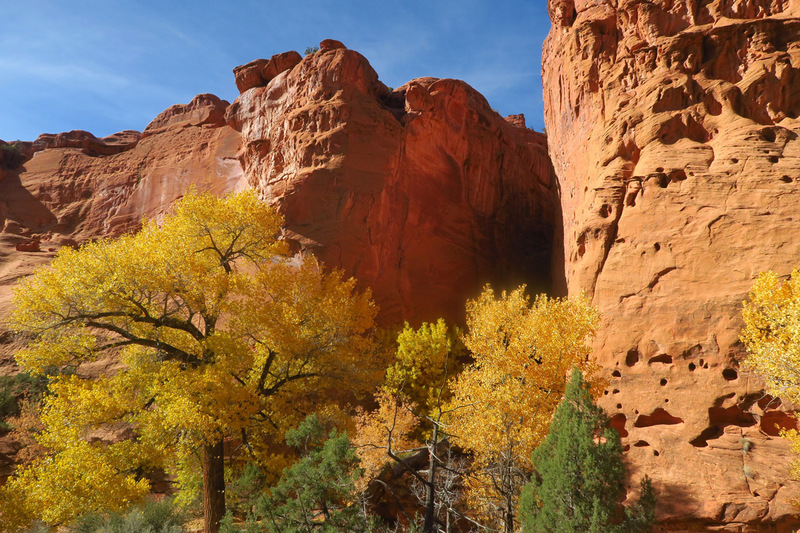 In mid-summer I’ve have found most nights on the Colorado Plateau to be pleasant enough to sleep without A/C and the daytime high’s to be bearable during high-energy activity such as hiking. Bring plenty of water, a broad hat and sunscreen. You take us to some of the most stunning vistas Suzanne. 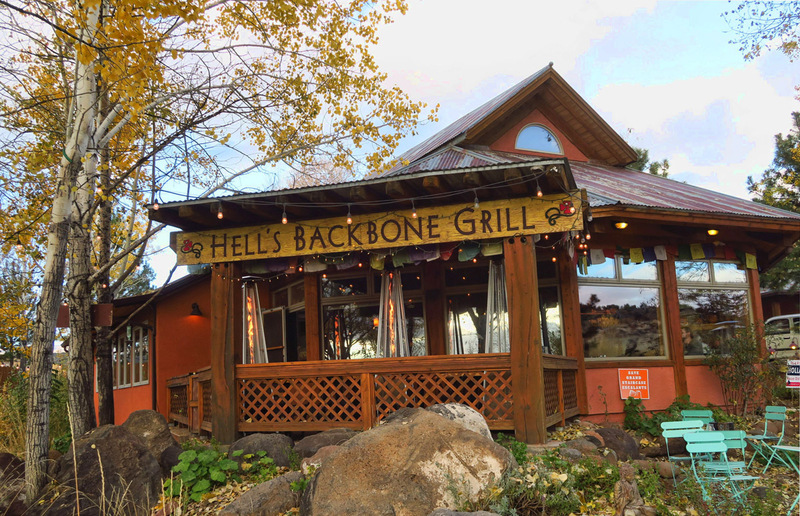 I had read Pam’s post a while back about Hell’s Backbone Grill and knew we had to go someday. Beautiful images!